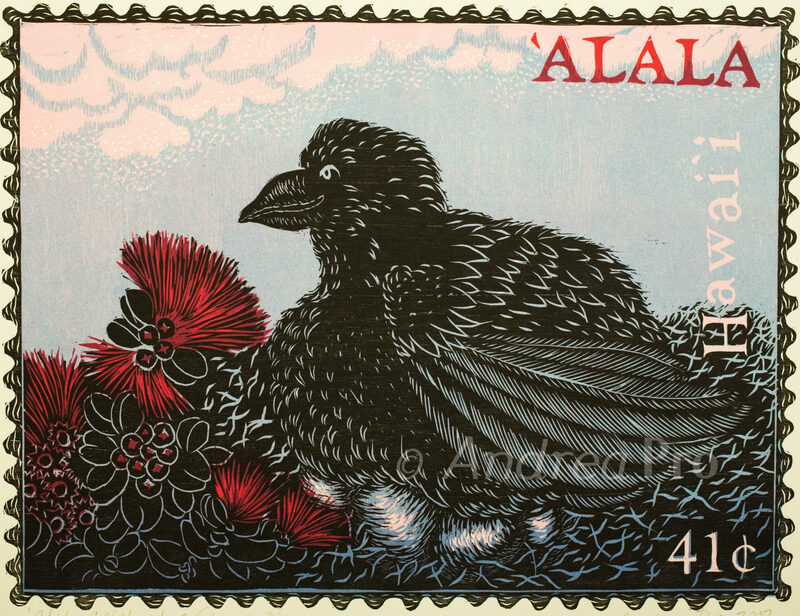 The `Alala is a Hawaiian crow, once abundant and now highly endangered. According to conservationists, there are no ‘Alala left living in wild. On Hawaii island The Keauhou Bird Conservation Center in Volcano is working to re-introduce the `Alala into the wild. In the past many difficulties have prevented progress. The population was so small that inbreeding was a problem. Also, in captivity mothers forgot how to raise offspring resulting in broken eggs and neglected hatchlings. I created this print after a dream in which I looked out of my bedroom window and found my yard full of young `Alala with adults teaching them to fly. The happy mother was my vision of hope for the future.